Christmas has officially started (after the last official one which was the Coca Cola Advert, and all the other official ones). It was Secret Santa day at work. The tension was building. Who would have who? Would anyone get socks? Would anyone get anything work-related? The presents were handed out by Ro Claus. We ripped into them. I had LOADS in my gift bag. I opened them to find Ro had been and attacked the American Sweet Shop in Leeds. I got a right haul. 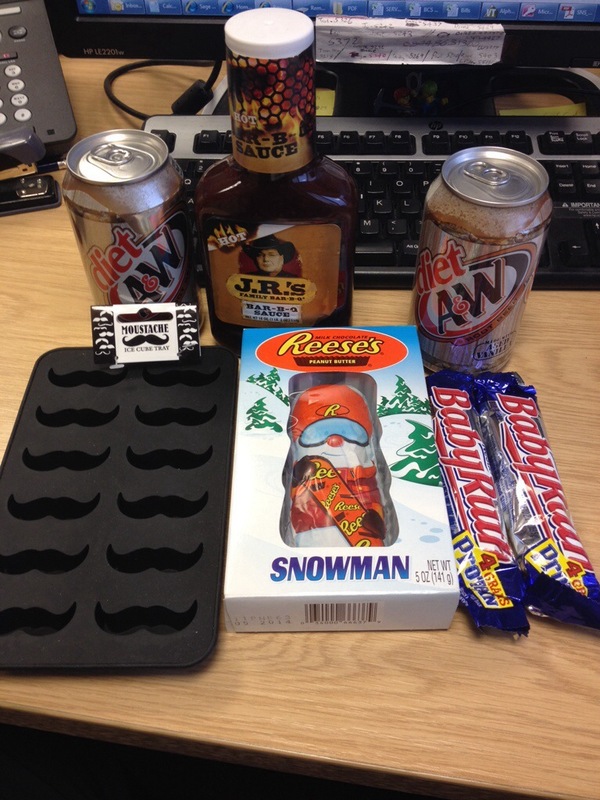 There’s a Moustache Ice Cube tray, root beer x2, Baby Ruth x2, Reese’s Snowman & JR’s Hot BBQ sauce. Cracking. Everyone loved their presents, which was a welcoming start to the festive season. Watched Apollo 13 tonight for no other reason than it was on the Sky+ planner and we need to start clearing things off for Christmas. I don’t think 13 episodes of Columbo are helping! This entry was posted in 2013, 365, Christmas, Movies and tagged Baby Ruth, columbo, jrsbbq, reeses snowman, Root Beer, secret santa. Bookmark the permalink.